The terms and conditions detailed below form an integral part of the travel agreement between Wings Of The Ocean – 64 rue Principale 57980 Tenteling FRANCE – and you, participating in the trip. You are responsible for becoming aware of the terms and conditions of travel agencies and the various service providers with whom you have entered into the travel contract, including Wings of the Ocean. Registration is made directly with Wings of the Ocean. As soon as your registration is accepted without reservation, the rights and obligations arising from the contract (including these general conditions of contract and travel) take effect both for you and for us. If the reserve person registers other participants in the trip, it is liable for their contractual obligations (including the price of the trip) as their own..
Our services are specified in the quote and / or in the proposal. Your particular wishes or related agreements become an element of the contract only if they have been confirmed in writing without reservation by the booking office. Prices shown on invoices are per person and in Euro. Prices in effect at the time of booking are valid, subject to price changes. As a general rule, when registering, the customer must pay a minimum deposit of 30% of the total amount of the invoice. The balance must be paid up to 30 days before the date of departure. In case of short-term reservation (less than 30 days before departure), the total amount of the invoice must be paid at the time of final registration. If we do not receive the deposit and the payment within the prescribed time, Wings of the Ocean is entitled to refuse the travel services. If you wish to modify the booking or if you cancel the trip, you must notify it personally or by registered letter to the following address Wings Of The Ocean – 64 rue Principale 57980 Tenteling FRANCE, simultaneously restoring the travel documents that you have received. When the booking is modified by the customer (eg change of name, change of travel dates included in the period covered by the program, replacement traveler, etc.) Wings of the Ocean is entitled to charge fees. Any cancellation of stay must be notified to Wings of the Ocean by registered letter. Howerver, as the payment is a donation to a Non-profit organization, it is non-refundable. In the case of imperative necessity (eg illness), cancellation costs are covered by a cancellation insurance, provided that you have concluded such insurance. The benefits are based on the clauses of the insurance policy. If you cancel your trip, the insurance premium “cancellation fees” remains due. Wings of the Ocean expressly reserves the right to modify, before your booking, the details of the prospectus, the description of the services, the prices appearing in the price brochure. If necessary, your booking office will advise you before the conclusion of the contract. We reserve the right to increase prices when the cost of the means of transport increases (eg increase in the cost of fuel), new taxes or surcharges (eg airport taxes), price changes exchange or taxes required by the state (ex: VAT). If the cost of these travel-related benefits increases, the cost of the trip will be increased accordingly. Wings of the Ocean reserves the right to modify, in your interest as well, the travel program, or certain agreed services (eg accommodation, mode of transportation, airlines, flying hours, etc.) in case of force majeure or if unforeseeable or unavoidable events so require. Wings of the Ocean will do its best to offer you a replacement of services of equivalent quality. We will inform you as soon as possible of such changes and their possible impact on the price. 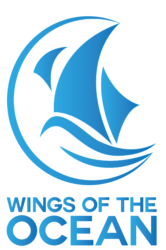 Wings of the Ocean may change the schedule of certain benefits for legitimate reasons, such as weather, local regulations, winds, etc..
Wings of the Ocean reserves the right to cancel a trip no later than three weeks prior to departure if the minimum number of scheduled participants is not reached. If unforeseeable cases of force majeure (eg cultural disasters, epidemics, disturbances, strikes, arrangements made by the authorities, etc.) seriously jeopardize the trip or make it impossible, Wings of the Ocean is entitled to cancel the short-term trip. For the same reasons, we reserve the right to interrupt a trip already in progress. If, in urgent cases (eg illness or accident of the person concerned, serious illness or death of a relative) you are obliged to interrupt the trip prematurely, the price of the travel arrangement can not be refunded to you . In case of repatriation, any costs incurred (ex: transport) are your responsibility. You will find information on the passport and entry requirements in the practical information. They are valid for French citizens or EC countries. Guests from other countries are kindly asked to indicate their nationality at the time of booking. You are personally responsible for the establishment or the extension of the travel documents, as well as for the application of the required visa (s). If a travel document can not be obtained or if it is issued too late and you are therefore obliged to forgo the trip, the cancellation clauses apply. Travelers are personally responsible for observing entry, health and currency requirements. Check before departure if you bring all the required documents with you. Wings of the Ocean makes you aware of the fact that in case of refoulement, the return costs are at your expense. We also draw your attention to the legal provisions sanctioning imports of goods and other prohibited imports. We will credit you with the amount of agreed benefits that could not be provided or that were provided unsatisfactorily, provided that our local representative or service provider was unable to provide you with a quality replacement service. equivalent on the spot and that a fault may be attributable to us or to our service provider. If international conventions and national laws provide for restrictions in compensation for damages resulting from non-performance or imperfect performance of the contract, we are only liable under these conventions and laws. International conventions and national laws with limited liability are mainly in force in the field of transport (air traffic, rail traffic and navigation in the river or high seas). Our liability is not engaged when the non-performance, incomplete performance of the contract or the damage is due to negligence on the part of the customer before or during his journey, unforeseeable or unavoidable negligence of a third party not participating not to the agreed contractual service, a case of force majeure or an unforeseeable or unavoidable event by ourselves, the intermediary or the service provider despite the care taken. In all such cases, any liability for damages on our part is excluded. 10.4. Damage to people, accident, etc. In case of personal injury, death, personal injury, etc. due to non-performance or incomplete performance of the contract, our liability is incurred only if the damage has been caused by us or by our service providers, subject to limitations of liability in international conventions and national laws (see figure 11.2). 10.5. Damage to goods, property, etc. For damages attributable to non-performance or incomplete performance of the contract, our liability is incurred only if the damage is due to negligence on our part or that of a service provider. Our liability is limited to a maximum of twice the price of the trip, subject to lower limits of liability in international conventions and national laws. 10.6. Valuables, Money, Jewelry, Credit Card, etc..
We expressly pay attention to the fact that you are personally responsible for safekeeping of valuables, money, jewelery, photo and video equipment, etc. In hotels, these objects must be placed in a safe. Our responsibility can not be engaged in case of theft, loss, damage, etc. We can not guarantee the respect of these schedules, in spite of a careful travel organization, In case of delay of the transport companies, for whatever the reason, we assume no responsibility for the damages, such as loss of salary, additional hotel nights, meals, etc. We strongly advise you to consider the possibility of delays when planning your trips. 10.8. Events or excursions during the trip. Apart from the agreed travel program, local events or excursions may be booked during the trip. It is not excluded that these events or excursions carry certain risks. If you participate in these events or excursions organized by third companies, you do so under your own responsibility, because in this case, Wings of the Ocean is not your contract partner. This editorial has been completed in June 2018. Wings of the Ocean reserves the right to make changes to the content of these terms and prices after this date. In case of dispute, the place of jurisdiction will be the court of Sarreguemines (France).